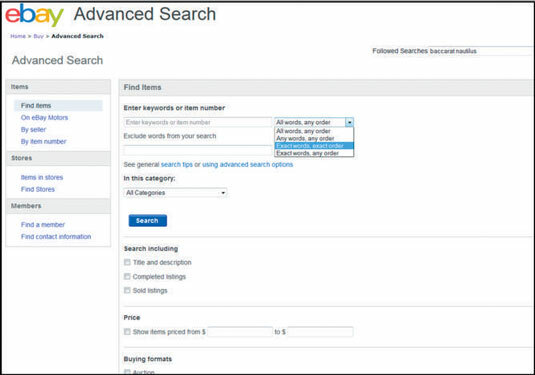 Find Items: Search by keywords, item number, in eBay Motors, or by an individual seller or bidder. Type the keywords that describe an item (for example, Superman lunch box or antique pocket watch) and click Search, and you can see how many are available on eBay. The site gives you the option to search by one of the main categories — but to get the largest number of items, use All Categories and then narrow your search from the results. Sellers on eBay are notorious for listing in the wrong category (especially when they’re rushed and upload lots of listings quickly). A search for all matching keywords will bring some of those hidden nuggets to the surface. Just peruse the pictures on the Search results page. Another handy way to search is by item number. Every item that’s up for sale on eBay is assigned an item number, which is displayed next to the item name on its page. To find an item by number, just type the number in the box, click Search, and away you go. Advanced Search drop-down menu: By clicking this link, you can define your search without using a bunch of code. It works pretty much the same as the basic Search method, but you can exclude more features from your search. You can also search by location to find items for sale in and around your neighborhood. The In This Category search filter is a snappy function that helps you figure out which subcategories have the item you want — or, if you want to sell, helps you decide where to list your item for sale. What you get is not only a regular search in a selected category, but also a column on the left side of the page that tells you which subcategories (within the top-level category you selected) list your item — as well as how many of the item you’ll see listed in each subcategory. By Seller: Every person on eBay has a personal User ID (the name you use to conduct transactions). Use a By Seller search if you liked the merchandise from a seller’s auction and want to see what else the seller has for sale. Type the seller’s User ID, and you get a list of every item that person has up for sale. By Item Number: Every item has a number (you can find it just below the Description tab on the item page) which uniquely identifies a listing. You can type in an item number you’ve saved there. (You can also type in an item number in the regular search box to find a listing as well). Items in Stores: When you use eBay’s advanced search, it searches eBay Stores for matching items. If you’re looking for a particular eBay Store, eBay provides a search box that allows you to search for a store by name (or part of the name).